Lovely heat over Copenhagen. The harbour is lined with gorgeous people and the beaches are likewise busy. I was on the harbour today for a meeting and here's a quick and dirty little film from last summer. Why not just ride to the beach in your bikini? And ride home from the beach with your mum? 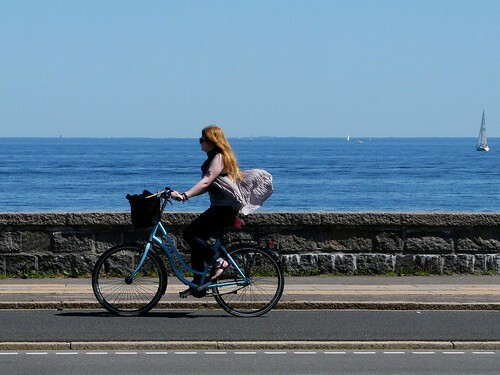 Or just roll past the ocean on a summer's breeze? San Francisco is waiting for its month of beach weather in September. I look forward to it. You know what they say Mark Twain said about the worst winter he ever lived through. Hey, it hasn't been that bad here! Love the chap on the right in the B&W picture. Proof at last that not everyone in CPH is svelte and chic and lovely. Or maybe he was a British tourist? 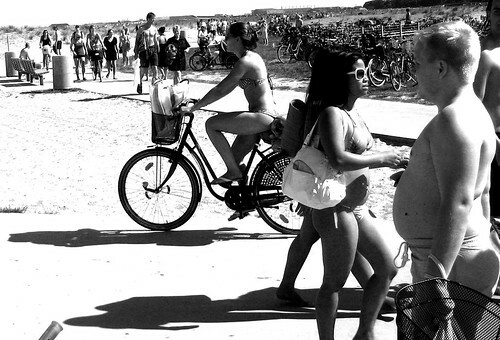 Lots of bikes and of happy people by the beach.